Diabetes is a condition in which your body cannot properly use and store food for energy. The fuel that your body needs is called glucose, a form of sugar. Glucose comes from foods such as fruit, milk, some vegetables, starchy foods and sugar. 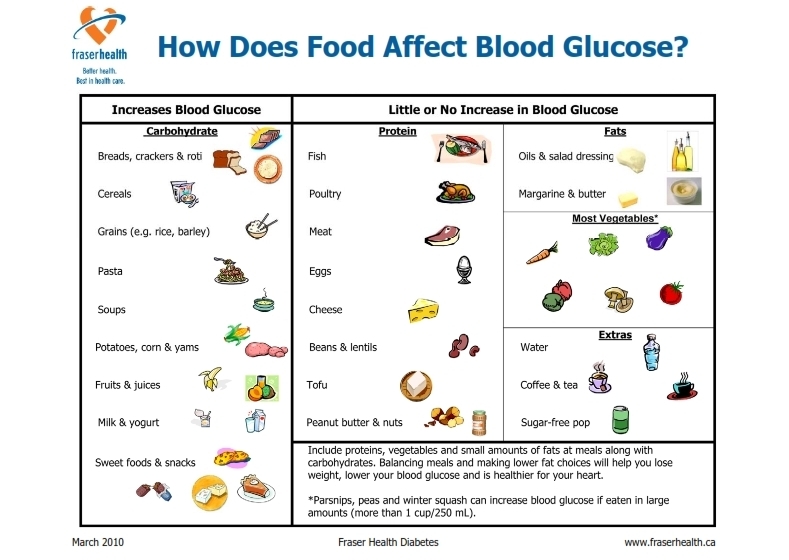 To control your blood glucose you will need to eat healthy foods, be active and you may need to take pills and/or insulin. This Diet is Low in Sweets and Refined Grains, Low in Saturated Fats and Trans Fats. It Focuses on Eating Regular Meals, including Low Glycemic Index Foods. your blood sugar levels. The goal is to include low GI foods in your diet; the food GI should be less than 55. For more information regarding the GI scale, go to www.diabetes.ca or click here. 1. Eat three regular meals per day, no more than six hours apart. Include small snacks between meals. 2. Eat high fiber foods such as whole and multigrain breads, cereals, pasta and rice; soluble fibers such as oat bran, psyllium and barley are great. Include whole-grain starchy foods at every meal. snack. Eating whole fruits is always better than juices. 4. Drink water instead of regular sodas and fruit drinks. Tea, coffee and low-calorie juices and beverages are great. “glycemic index” and visit www.diabetes.ca. hydrogenated margarine. Try not to fry your foods.